Earlier this morning I received a rather innocuous email from the Green Party asking me to make a political donation. I’m interested in politics, but I don’t belong to any political parties. I cast my ballot based on the issues in that election and whether the local candidate supports the causes that I care about — for me, public transit is a biggie. So, when the Greens asked me for money, I felt compelled to respond, as their candidate had not impressed me during the last federal byelection. I appreciate the note, however, I cannot in good conscience donate to your party at this time, following the position your candidate took on public transit in the recent federal byelection in my riding (Toronto-Centre). John Deverell, although very well spoken, did not support expansion or funding of public transit in either Toronto Centre, or the City of Toronto in the election debate that I attended. His position was that Toronto already has transit and other communities are in greater need. If you would like my vote, let alone a donation, please field a candidate that will enthusiastically work to support their constituents. Toronto has a desperate deficit of public transport infrastructure; I was very disappointed that your party, via your candidate, did not support the obviously “green” alternative to private autos. My message to the Greens, or any political parties that may be reading: if you want my vote, then be sure to support public transit 100%. Hint: I like what Olivia Chow has been doing lately at the federal level, with respect to public transit. 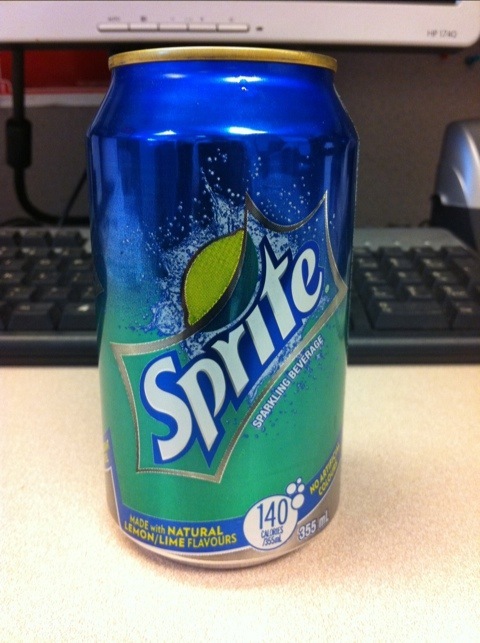 Doesn’t sparkling beverage mean wine? So I have just experienced weekend subway construction firsthand. For those who don’t know, the TTC has closed several stations on the Bloor-Danforth Subway from Jane to Kipling for the entire weekend. Jane is normally a “line” station with side platforms. It was not built to accommodate large crowds that occur at ends of lines and significant transfer points when the entire train, or a good portion of passengers, need to de-train. Once upstairs, the hoarde was forced into replacement buses, which were sorely inadequate to handle the crowd. Once I crammed aboard the bus, it travelled fairly quickly, for a bus. Thankfully, the bus did not service local stops on Bloor, but the automate system continued to read out the stop names. The driver DID NOT announce the equivalent subway stops, so if someone were not paying attention it would have been easier to miss, particularly since this sort of closure is outside if everyone’s usual routine. I happened to be heading to Islington on this occasion. The TTC had a few supervisors present, buy they were really only there to answer questions. There were no announcements or signs at the bus stop to point disoriented travellers in the right direction. I had to ask how to get to the Mississauga Transit buses (now branded as miway). Since the subway and bus platforms were closed, all of the miway routes were being serviced by a single bus stop on the street corner. As you can imagine, one bus stop is insufficient for a large number of riders all looking to take different routes. This concludes the story of failure. What I don’t understand is why the TTC feels it is necessary to close to entire subway during regularly scheduled service. They close every night for maintenance already…. Other cities somehow manage to operate 24 hour metro service. Why can’t the TTC do their maintenance using the existing closure period? This habit of closing the subway during service for regular maintenance is leading to an impression of unreliable, degraded service. So I ask again… Why? Hmm? 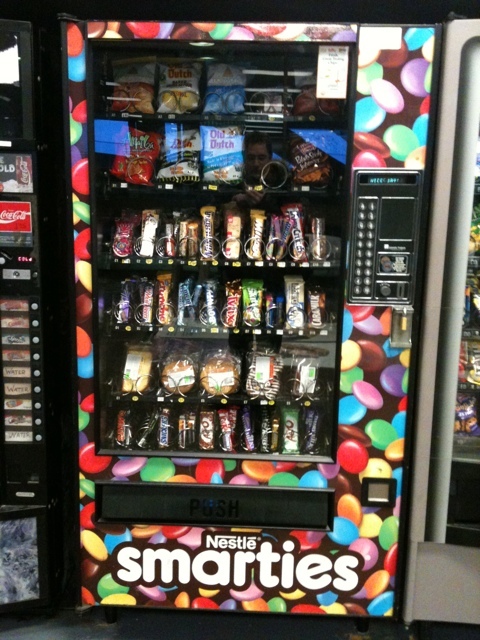 This vending machine does not sell Smarties. Is that an unreasonable expectation? 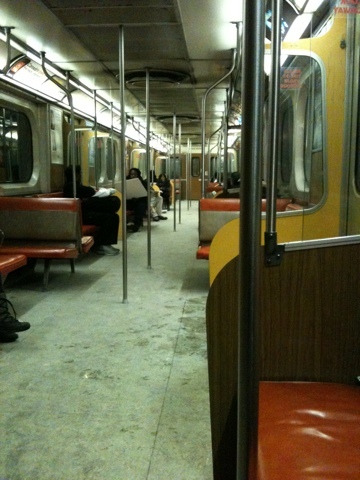 I just enjoyed a (somewhat) rare trip on an old Hawker-Siddeley H5 subway car. Plushy seats are a nice change, but the heat was out and it smelled like something was burning! I also wanted an excuse to try out WordPress for iPhone… WP for BlackBerry was a big disappointment. Update: January 19, 2011 – Added link to Transit Toronto H5/H6 page. I have never before seen six TTC buses (five pictured) queued at an intersection, not in service. I wonder if they’re preparing for blue night service, or subway replacement service on the Yonge subway line? Any ideas? 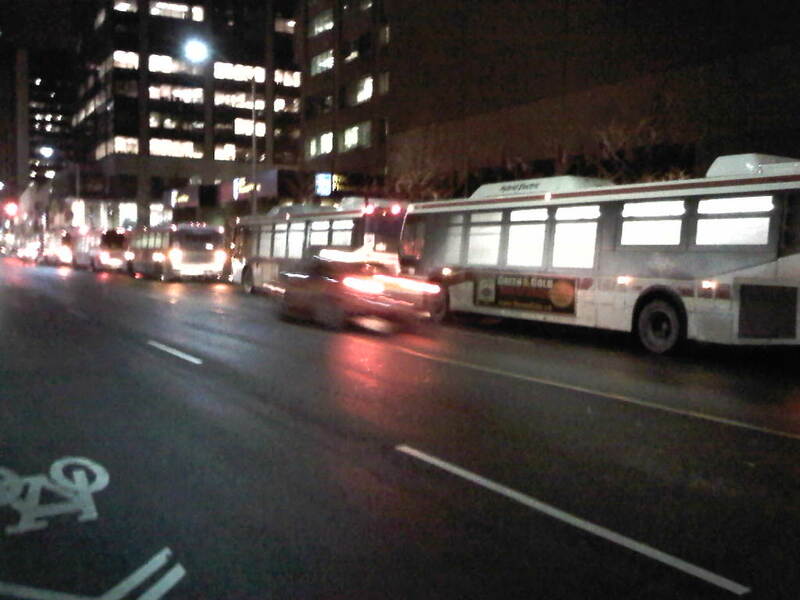 Five TTC buses sighted waiting at Yonge and Bloor at ~12:30 am on Tues Dec 14. Update: Subway Replacement bus service between Bloor and Finch is in effect until Dec 19th, starting at 12:30 AM. CBC.ca has recently posted a great article on chocolate milk. They go in-depth into the ingredients of milk and dairy beverages. Check it out!